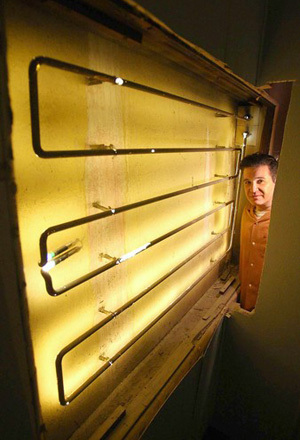 While renovating the historic Clifton’s Cafeteria in Los Angeles, the building’s new owner Andrew Meieran discovered a neon light that had been left on for at least 62 years. The light was probably installed in 1935, when the restaurant’s original owners bought the building in order to create a forest-themed restaurant in downtown LA. In 1949 the light was covered by a partition—but left on—until Meieran discovered it in February of this year. He estimates the electricity bill for keeping the light on for more than 60 years is $17,000.